Having passed on the mantle of 200 Series Register Keeper last year there was one piece of business that was left incomplete, and that was this article, to compliment the other 'Living with..' articles on the other models of Volvo car. 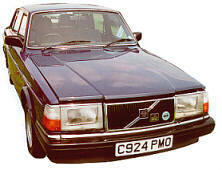 In December 1985 I bought my first Volvo car, having previously owned 2 Fords and a Renault. When I was looking for a replacement for my Ford that had been written off in an accident that I would not class as serious, but the offending car, a Jaguar, had hit my Ford in the rear nearside corner and caused the roof to buckle. So I decided that a safer and stronger car was needed, and considering that I would be travelling the M4 with my children a lot. I looked at 2 Volvo's, a 244GLE and a 264GLE, both of 1981 vintages. The 244 looked nicer with its silver bodywork and black trim with black leather inside. The 264 had blue cloth interior and did not look as good. At the time I knew nothing about the mechanics of Volvos. I did not know that the 264 had AC and power steering, but then I'd lived without those anyway. I took the 244 out for a drive and I was smitten. It felt sturdy and secure on the road, and it drove wonderfully. Smooth and quiet, with quite a remarkable acceleration. A factory fitted sunroof, and heated front seats. It had a 2.1 fuel injected engine with a 4 speed gearbox with overdrive. Wonderful, fetch the contract. Where do I sign? The 60,000 miles on the clock did not worry me at all, as I had heard about the high mileage possible with these cars. The high seating position gave a great feeling of security, and the vision was excellent. The seats were like none I had sat in before, firm and comfortable. And the seat heaters were just marvellous. Please, let it be a very cold winter this year. The car was a dream to drive, so positive with the steering, and the best set of brakes I had encountered in a car of this class. The legroom for rear passengers was very good, and the boot space more than ample. This was a car I would want to drive and drive. My first drive down the M4 from London to Wales was a few days away and I looked forward to it greatly. On the day of the journey the weather was dreadful, heavy rain. I set out, with some friends who were travelling with me. In no time the car was up to 70mph and cruised so smoothly but with a great feeling of safety on the road. It was an effortless drive, and at the end I got out feeling fresh, with none of the aches often associated with long drives. The fuel consumption was excellent, around 31mpg for the motorway journey. So how did it stand up to the demands I made of it over the following 14 years? I have to say it stood up admirably. I bought a Haynes workshop manual and started to investigate what was under the bonnet, and how the rest of the car worked. I soon started to do my own servicing and found it was a very easy car to work on, quite basic in fact. The only area I did not yet look into was the Bosch K-Jetronic fuel injection system. One weak spot I found was the fuel injection relay, a known problem. They never lasted long, they kept burning out. So I always kept a spare one in the boot. It is just as well, because one evening we were going along the M4 into London to meet my daughter for dinner when the engine cut out without warning, and would not restart. Fortunately I was near the off slip and I pulled in. When the RAC came he diagnose a faulty injection pump relay, and a quick visit to the boot to retrieve the spare and off we went. The relay was later modified but I still kept one in the boot. For some reason the car always suffered with this relay problem, even the modified one. Other weaknesses of the car are slow windscreen wipers, even at double speed, and less than adequate light from the big headlamps. When new, the headlamps give out a reasonable amount of light, but the reflectors get tarnished quickly and deteriorate and the amount of light given out gets less. One 240 owner complained to Volvo UK after being told by a dealership that the only answer was to replace the reflectors, which are not cheap. In a letter from Volvo UK, the 240 owner was told that the life expectancy of the headlight unit was about 5 years. Not bad for a car that was supposed to last at least 17 years. I have always believed in regular oil changes and use good quality oil. From the beginning I used Mobil engine oil and changed it every 3-4000 miles. When Mobil 1 came out I would change it after 4-5000 miles. I always used a genuine Volvo oil filter and air filter. I also learned early that the crankcase breathing system was not very efficient and needed cleaning often. This I would do every oil change. The pipes and throttle were liberally cleaned using an aerosol of car cleaner, and the flame trap replaced. I later removed the flame trap after a Volvo mechanic said that it was common practice to do so. I changed the gearbox oil and put in Amsoil gearbox oil. At first I used Volvo brake pads and shoes, but I later changed to Ferodo, much cheaper but still very good. The brake master cylinder was replaced at 80,000 miles. The prop shaft was balanced once and one UJ replaced, and all discs replaced after about 120,000miles. At around 150,000 miles the shocks were changed. I didn't use Volvo parts I phoned Ashley Banks and got a set of Koni's from them. The front wheel bearings were replaced at around 160,000 miles. It had a new clutch at around 180,000 miles. Nothing major was ever done to the mechanics of the cars, and when I sold it in January 1999 it had 232,000 miles on the clock and still purred. A lot of preventative maintenance was also used, such as regular changing of injector seals, plugs, HT leads, coolant and brake fluid. The flexible brake hoses were changed once, at around 100,000 miles. Most of the bushes also got replaced at 100,000 miles also, and that made a great transformation in the feel of the car on the road, and noticeable reduced steering vibrations. Over the years I had customised it a bit, and it was an easy car to work on. Numerous addition Volvo gauges were added; the sunroof got an electric motor. On a club trip to Sweden I bought a cruise control kit for it. I also fitted power steering to it, getting all the parts from a scrapped 240. The conversion was very easy, and what a difference it made. Parking was much easier. The car maintained its good appearance for many years, but in the early 90's I noticed some rust forming on the rear wheel arches and bottoms of the front wings near the front doors. I had Waxoil'd the car soon after buying it but it had not halted the rust. I treated the areas and set around checking the rest of the car. On lifting the floor mats I was met with a horrifying sight. The gullies under the front seats were filled with water. After clearing out the water I found that rusting had started in a few places. So I drilled a hole each side to allow any further water to drain out and treated the entire area. The search for the source then began. I found that several of the seals and grommets in the bulkhead were letting in water, so they got fixed. I then found that water was also leaking from the behind the trim either side of the front foot wells. It transpired that water running into the grill between the screen and bonnet runs along a gully and then down the box section behind this trim. The protective waxed paper behind the trim had got dislodged and allowed the water to run into the car. During my years as register keeper I found that this was not an uncommon problem. Even late 240 estates suffered badly with leaks from the side windows, sometimes causing very serious rusting of the floor. I found out that many early 80's 240's with metallic paint suffered rusting in similar places. The rear wheel arches, bottoms of the front wings near the front doors, and the lower leading corners of all four doors. Tailgates on the estates suffered dreadfully. It seems that the anti rust process used to great success on earlier Volvo's had been changed and was not so good on many 200's. The other common problem with this model Volvo was that the front nearside tyre suffered excessive wear on its outside edge. This was due to the steering and suspension geometry. It was partially addressed by Volvo producing a harder wishbone bush for that side. I had 15 years of enjoyment and safe motoring from the 240, with complete reliability. And I think it was quite economical also. The only car that could tempt me away from another 240 was an 850 T5 that was available at the right time. It is a shame that production was eventually stopped; it was a great seller, a very popular car. It had a reputation as being a sturdy workhorse, a well-deserved reputation.